available as an open source solution since 2008 free of charge. provides information for existing and prospective members. future POWERLINK and openSAFETY developments. investment security for both users and manufacturers. (CAN in Automation), IEC and ISO. the word "open" applies in a technical sense as well. of the control system manufacturer. Take advantage of these possibilities to present your products at EPSG exhibition booths all over the world. Take part in roadshows and establish valuable contacts in new industries. Your customers all over the world will be sure to approve. Additional support is also provided for your PR activities. We can promote your products through our close cooperation with over 100 trade magazines – an enormous benefit that will allow you to communicate even more effectively. 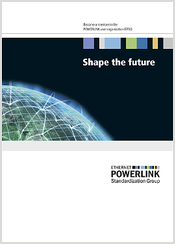 Take advantage of the EPSG online newsletter and inform the worldwide POWERLINK community about your innovations. Effectively prepare your products for certification using an approved tool and take advantage of the possibility of testing the POWERLINK connection for conformity to relevant specifications. Certification by the EPSG ensures a uniform standard on the market, and certification of the first product group is free of charge for EPSG members.